Quality by design (QbD) is an essential part of the modern advance to pharmaceutical quality. QbD is best key to build a quality in all pharmaceutical products. Under this concepts of be throughout design and growth of product, it is important to identify desire product performance report [Target product profile (TPP), Quality Target product profile (QTPP)] and identify critical quality attributes (CQA). To recognize the impact of raw material [critical material attributes (CAM)], critical process parameters (CPP) on the CQAs and identification and control sources of changeability. The plan of pharmaceutical development is to design a quality products and its manufacturing process always deliver the future performance of the product. The base of Quality by design is ICH Guidelines Q8 for Pharmaceutical for development, Q9 quality risk management, Q10 for pharmaceutical quality systems. In Quality by Design, Quality is important word. So Quality is “standard or suitability for intended use.” This term includes such attributes as the identity, potency, and purity. Pharmaceutical industry are alert on product Quality, Safety, and Efficacy. Product quality has been increasing by implement scientific tools such as QbD (Quality by Design). Scientific approaches will provide the clear and sufficient knowledge from product development to manufacturing. These QbD tools will minimize the risk by increasing the output and quality. Nowadays QbD approach has been successfully implemented in common formulation development. USFDA has released specific QbD guidance for immediate and extended release drug products as well as biotechnological products. Regulatory authorities are always proposing the implementation of ICH quality guidelines Q8 to Q11 . According to ICH Q8 guidelines, QbD is defined as , “ A systematic approach to development that begins with predefined objectives & emphasizes product, process understanding & process control, based on sound science & quality risk management.” It means that, design & develop the formulation & manufacturing process to make sure predefined product quality. It requires an understanding of how product & process variables influence product quality. It is a systematic process to build the quality in to final product. QbD requires identification of all critical quality attributes and process parameters as well as determining the level to which any variation can impact the quality of the final product. Quality by Design is a concept first outlined by Joseph M. Juran in various publications. He supposed that quality could be planned. The concept of QbD was mention in ICH Q8 guidelines, which states that, “To identify quality can not be tested in products, i.e. Quality should be built in to product by design.” In 1970, Toyota pioneered many QbD concepts to improve their early automobiles, since that time other industry technology, telecommunication & aeronautics taken this concept & make QbD. In 1990, Medical devices began to show that incorporated many qualities by design aspects. In mid-2002 FDA published a concept paper on cGMP for 21st century . These documents expressed a desired that companies build quality, safety, & efficacy in to their new product as early as possible. ➢ The main objectives of QbD is to ensure the quality products, for that product & process characteristics important to desired performance must be resulting from a combination of prior knowledge & new estimation during development. ➢ From this knowledge & data process measurement & desired attributes may be constructed. ➢Experimental study would be viewed as positive performance testing of the model ability through Design space. ➢ Ensures combination of product & process knowledge gained during development. • Better understanding of the process. • Ensure better design of products with less problems in manufacturing. • Allows for continuous improvement in products & manufacturing process. • Enhances scientific base for analysis. • Provide for more flexibility in decision making. • Ensures decisions made on science & not on observed information. Advancement in the pharmaceutical development & manufacturing by QbD can be explained against traditional approach as below (Table 1). Pharmaceutical Development Empirical Systematic, multivariate experiments. Mfg. process Fixed Adjustable within design space. Process control Offline analysis wide or slow response. PAT utilized for feedback and provide to real time. Product Specification Based on batch data. Based on the desired product performance. Control strategy Mainly by intermediate product and end product testing. Riskbased, Controlled shifted upstream, real time release. Lifecycle management Post approval changes needed. Continual improvement enable with in design space. Table 1: Pharmaceutical Aspects: Traditional vs. QbD approach. 1. In QbD Process, first define Target Product profile (TPP) & Quality Target Product Profile (QTPP) which describes use, safety & efficacy of product. 3. Carry out the risk assessment linking material attributes & process parameters that must be controlled to achieve desired quality product. 4. 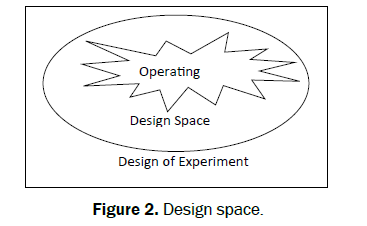 After that, confirm the Design space (Figure 2) (i.e. Requirement for in-process drug substance & drug product attributes) these conditions are established based on several sources of information. Figure 1: Flow of quality by design. 5. Implement a control strategy for the entire process using in-process & end of process controls. 6. Perform the continuous improvement to get consistency in quality of products. The TPP is a patient & labeling centered concepts, because it identifies the desired performance characteristics of the product, related to the patient’s need & it is organized according to the key section in the drug labeling. Pharmaceutical companies will use the desired labeling information to construct a target product profile .The TPP is then used to design the clinical trials, safety & ADME studies as well as to design the drug product, i.e. The QTPP. A CQA has been defined as “a physical, chemical, biological or microbiological property or characteristics that should be within an appropriate limit, range, or distribution to ensure the desired product quality.” Identification of CQAs is done through risk assessment as per the ICHQ9. Critical Quality Attributes are generally associated with the drug substance, excipients, intermediates and drug product. Critical Quality attributes includes the properties that impart the desired quality, safety, and efficacy. CQAs for biotechnological products are typically those aspects affecting product purity, stability. Drug product CQAs can be identified from the Target product profile. Use of strong risk estimation methods for identification of CQAs is new to the QbD standard. Risk assessment is the linkages between material attributes & process parameters. It is performed during the lifecycle of the product to identify the critical material attributes & critical process parameters. A material attributes can be an excipients raw material, drug substances, reagents, solvents, packaging & labeling materials. A material attributes can be quantified & typically fixed but sometimes can be changed during further processing. E.g. Impurity profile, porosity, specific volume, sterility. Process parameters variability has an impact on a critical quality attributes & therefore should be monitored & controlled to ensure the process produces the desired quality. (ICHQ8) Process parameters can be measured & controlled. ➢ The evaluation of the risk to quality should be based on scientific knowledge & it provides safety to the patient. ➢ Describes systematic processes for the assessment, control, communication & review of quality risks. ➢ Applies over the products lifecycle, development, manufacturing & distribution. • A material attributes is critical when a practical change in that attribute can significantly impact the quality of the output material. • A process parameters is critical when it has a high impact on a critical quality attributes. • CPPs are responsible for ensuring the CQAs & it is identified from a list of potential CPPs using risk assessment. ➢ Unclassified parameters: The criticality of unclassified parameters is undetermined or unknown. The additional data are needed to classify an unclassified parameter as critical or non-critical. ➢ Critical parameters: A parameter is critical when a realistic change in that parameter can cause the product to fail to get the QTPP. ➢ Non-critical parameter: No failure in QTPP observed in the potential operating space & no interactions with other parameters in the established suitable range. Examples for CPP: Temperature, addition rate, cooling rate, rotation speed, pH, agitation, dissolved oxygen. The linkage between the process inputs and critical quality attributes can be described in the design space. A design space is a way to represent the process understanding that has been established. It is proposed by Applicant and reviewed by controller. In a typical design space approach a sponsor identifies the unclassified parameters and then does a DOE on some of the unclassified parameters with the other unclassified parameter. Analysis of historical data can provide the basis for establishing a design space. How a design is developed, it is expected that operation within the design space will result in a product meeting the defined quality attributes.Once design space is accepted, then regulatory post approval change requirements will be simplified inside space. When you define your design space, then you are able to plan how to control process. Control strategy is defined as, “A designed set of control, derived from current product and process understanding that assures process performance and product quality.” A control strategy is designed to ensured that product of required quality will be produce consistently. Once sufficient level of process understanding is achieved, a control strategy should be developed that assures the process will remain in control within normal variation in material attributes & process operating ranges. A control strategy may include input material controls, process controls, and monitoring, design spaces around individual or multiple unit operations, and final product specifications used to ensure consistent quality. The control strategy in the QbD standard is established via risk assessment that takes in to account the criticality of the CQAs. IFM (Impurity Fate Mapping) - Is such an example in which raw material & process impurity sources are identify & their fate mapped throughout process. Remove impurity is an essential element of control strategy. Influenza (flu) is caused by influenza viruses & is spread mainly by coughing, sneezing, & close contact with infected person. Flu is communicable disease that spreads around the US every winter in Oct.
Vaccination is the phenomenon of protective immunization. In modern concept vaccination involves the administration (injection or oral) of an antigen to obtain an antibody response that will protect the organism against future infections. Attenuated viruses are the genetically modified pathogenic organisms that are made non pathogenic &used as vaccines. Attenuated strains of some pathogenic organisms were prepared by prolonged cultivation for weeks, months or years. Due to this, infectious organism would lose its ability to cause disease but retains its capacity to act as an immunizing agent. Flu vaccine is the best protection against flu & its complications. Flu vaccine is also helps to prevent spreading flu from person to persons. Flu vaccine can not prevent all cases of flu but it is the best protection against the acute respiratory diseases. 1) If they have any severe, life-threatening allergies. E.g: Allergy to gelatin, antibiotics or eggs, you may be not to get vaccinated. 2) If you are not feeling well, then also not to get vaccinated (Table 2). Mechanism of Action Type A Ã¢ÂÂVAX is a pentavalent vaccines containg the capsular polysaccharide of 5 serotypes, each linked to a recombinant non Ã¢ÂÂ infectious virus- like particle (VLP).Expected to produced enhanced cellular antigen specific protective immunity. Indication Active immunization of 2-60 month old infants and children for prevention of disease related illnesses due to causative agents. Primary Endpoints 70% reduction of confirmed disease within 1 year after dosing in the target population, safe and tolerable. Key Claims Easy to administer, 0.5ml subcutaneous delivery in an outpatient setting using a 1ml syringe.Stability-2 years at RT. Primary packaging: Single dose vial, clear Type 1 glass.Secondary packaging: 10 vials/cartons. 1) Modern cell-culture technology potentially allows for quick, efficient production. 1) Cell propagation/Preparation of substrate. 5) Blending, Filling, & Approval. 1) Cell propagation/Preparation of substrate: Take the frozen, preserved cell culture from WBC cell line & grown in an incubator at 37°c. Then this cells are first grown in small volume of culture medium, due to this cells are grown & multiply. Then transfer in to succively larger container. 2) Virus propagation: Once a high number of cells have been produced, Add influenza seed virus obtained from WHO diagnostic laboratory in to cell containg bioreactor (Fermenter) where virus infects the cells & multiplies & produce the more virus particles. After several days viruses destroyed the cell in bioreactors. The virus is harvested by removing the waste made by the cells and made non infectious. 4) Inactivation and splitting: A chemical process is used to inactivate the virus, stripping it of its ability to infect, for that formaldehyde is used, this is called as splitting. Then the surface antigen is separated and extracted from the virus. 5) Blending, filling and approval: Non infectious solution is blended, concentrated and filled into sterile syringe. By using QbD the following parameters should be controlled during vaccine production process . 1) Cell propagation: In this step, limiting concentration of nutrients may be helpful for optimal cell growth. If high nutrient concentration then it inhibit cell growth. For that to do on line monitoring of the nutrients concentration. 2) Virus prorogation: The following variable parameters controlled during fermentation process. • pH: for maximum effectiveness of fermentation can be achieved by continuous monitoring pH i.e. It required most favorable pH. • Temperature: Temperature control is important for good fermentation process. If temperature is lower then it causes reduced product formation & if it is higher then it affects the growth of organisms. For avoiding this, bioreactors equipped with heating & cooling system as per the requirement to maintain the reaction vessel at optimal temperature. • Dissolved oxygen: Optimal supply of nutrients & oxygen, due to this it prevents the growth of toxic metabolic byproducts. • Agitation: Good mixing also creates a favorable environment for growth & good product formation. If agitation is excessive then it damages the cells & increase temperature of medium. • Foam formation: Avoiding this parameter antifoam chemicals are used such as mineral oils, vegetable oils which lowers the surface tension of the medium & causes foam bubbles to collapse. Also mechanical foam control devices fitted at top of fermenter. 4) Inactivation: Optimum concentration of formaldehyde is used for inactivation of viruses. Quality by design is an essential part of modern approach pharmaceutical quality. Identification of critical material attributes that provides a link of the product quality to the mfg. process. The role of control strategy as the mechanism for completion of QbD elements into practice . It is an efficient path to the design space through the identification of non interacting process variables. QbD also having wide scope in biotechnological products such as vaccines, enzymes, monoclonal antibody etc not only in dosage forms. Quality by Design acts as a regulatory shift, which facilitate manufacturing designs and product approvals for vaccines & other products. Gillian Doherty and Jane Beach Martha Friendlyn “Quality by design: What do we know about quality in early learning and child care, and what do we think?” A literature review pp. 1-32. Lawrence X.Yu (2006) Director of science. “Implementation of Quality by Design”, Question based review. AnatIB (2013)QbD Strategy Leader, “Bud implementation in Generic Industry: Overview and Case-Study” IFPAC JAN.
SatyanarayanaU “A text book of Biotechnology”. p. 513. Nishendu P et al. (2012) “A complete review of Quality by Design”. Int J Pharm Sci Rev Res 17:20-28. Lawrence X. Yu(2008) “Quality by Design: Concept for ANDA’s” .AAPS J 10: 268-276. ArvydasA et al. (2009) A novel mammalian cell-culture technique for consistent production of influenza virus vaccine. In Vaccine 27: 6022-6029. Dama GY(2010) Simultaneous Estimation of Ramipril and Enalapril by Using HPTLC. International Journal of Universal Pharmacy and Life Sciences1: 1-10.